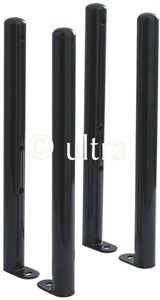 Ultra Colosseum > 4 x Floor Mounting Colosseum Radiator Legs (Black). 4 x Floor mounting radiator legs in high gloss black. Suitable for Ultra Colosseum radiators only. The Ultra Colosseum range of column radiators brings a tradition feel to any room and offers impressive heat output. 10 Year guarantee: Ultra guarantee their Colosseum range for 10 years.